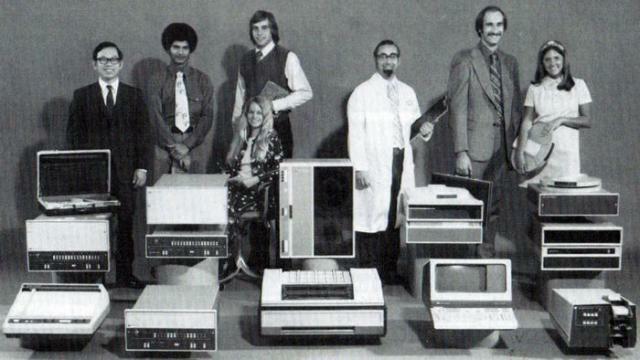 Customer value, the Seventies’ HP Way with products designed for your maximum customer value obtainedthrough HP’s product research, innovation, experience, support, humanengineering and quality control. Hewlett-Packard, a world-wide leader in the minicomputerfield, produces computers, small and medium scale systems and a host ofadd-ons. This equipment is finding increasing use in companies of all sizes fordata management, information retrieval and for automating measurement. Tocomplement this equipment, Hewlett-Packard provides the largest selection ofoperating software in the industry. The company’s entrance into the computational field beganwith a minicomputer designed specifically to interface with HP’s test andmeasurement instruments so customers could easily combine data gathering withdata processing. HP minicomputers have since entered other areas of applicationincluding science, industry, education and business. As key elements in the company’s timeshared and datamanagement systems, for example, the minicomputers handle such tasks as orderprocessing, inventory control, sales analysis, production scheduling andfinancial reporting. In schools and colleges HP computing systems are used atall levels of education for problem solving, computer-assisted instruction,complex model simulations, computer science education and curriculumdevelopment. Systems also are available to perform administrative and studentrecord keeping tasks. When you purchase computational equipment from HP, you areassured of receiving the same value you have learned to expect ofHewlett-Packard instruments. HP assures this high value by consistently investing10% of net income in new product research and development. In-depth research has provided innovations such as the firsttime-shared computer system based on a minicomputer and the first user micro programmableCPU from a major manufacturer. A recent innovation, the first minicomputer withall semiconductor memory from a major manufacturer is an advancement thatprovides simultaneous reductions in size, weight, power consumption and costwhile improving speed and reliability. Hewlett-Packard has one of the largest installed customerbases in the world. Over 10.000 HP computers are presently in operation onevery continent and in most countries of the world. To support this largeinstalled base, Hewlett-Packard has extensive sales and service organizationsplus the experience to meet your individual needs. The new family of computer terminals from HP has establishedthe industry standard for serviceability. These units are easily serviced byreplacement of plug-in boards and built-in self-testing circuitry. This meansthe units can be built for less and maintained at lower cost for you. Additional customer support is provided by hardware and softwaretraining courses at central locations throughout the world. Both maintenanceand user oriented courses areprovided. Video tape facilities are usedsuccessfully to bring HP factory expertise to remote locations. Hewlett-Packardalso supports a number of user groups with up to date information, informationexchanges, periodic publications and regional meetings. Product excellence does not stop with well designedcircuitry at Hewlett-Packard. HP applies the same diligence to the humaninterface with its equipment. The new family of computer terminals, forinstance, features dot-shifting techniques to improve readability and anon-glare CRT screen. This same terminal family provides a movable keyboard sooperator convenience is maximized whatever the situation. For years, .users involved in critical applications havespecified Hewlett-Packard products because of HP’s known high reliability andenvironmental standards. This quality control excellence can be tracedpartially to HP’s management practices. All HP quality control functions reportdirectly to division management, not to manufacturing management. This meansthat any product inadequacies receive top priority attention and products thatdo not meet tough standards are not shipped until they do.